Situated at the rear of Kay Street Baptist Church, Antioch Christian Bookroom is a social enterprise company limited by guarantee and run by volunteers from several local churches. We stock Bibles, Christian books for all ages, cards for all occasions, CDs, Bible reading notes for groups and individuals, Sunday School materials and Fair Trade food, gifts and cards. We are unable at present to accept payment by credit/debit cards. St Andrew's Bookshop, Reading, became part of the Quench Bookshops group in mid-2009. We're only a small shop, so sometimes we may not have exactly what you need in stock. On those occasions we'll very gladly order it for you, most items arrive within a few days and remember - there'll be no handling and packing charges, no delivery or postal charges and there'll also be a smile from the person who hands over your item when you collect it from the shop! Our mission is twofold - we provide a source of Christian material for the people of Redditch and we give the profits away to Christian youth and schools outreach work. 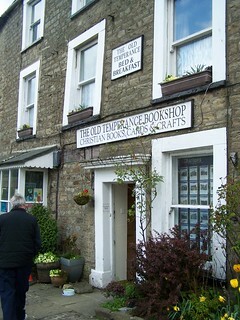 We found this delightful and well-stocked oasis of Christian literature, Fairtrade products and more, in the centre of one of England's loveliest villages. Well worth a visit. Our two shops have been serving the community for over 14 years, and the profits have been given away to help a variety of projects all over the world. For the Last 14 years, our Coffee Shop has been serving the community of Retford. With some truely amazing home-made cakes and treats, in a lovely atmosphere! Come along and try our amazing range of home made cakes. Oasis opened in September 1984 and we now have many book agents working across the region selling stock out of hours. Winners of various awards over the years including UK Small Retailer of the Year in 2009. Ecumenical staff. Oasis is an inter-denominational Trust seeking to share the Gospel of Jesus, provide an outlet for goods produced in developing countries, pass on excess income to projects at home and overseas and to act as a focal point for local Christians. Small shop display area with coffee and arm chairs. Ideal for book agents to take time and relax whilst selecting books, gifts, music for their church bookstall (S&R available). We have large stocks on a wide range of Bibles too. Gospel tracts, posters and church print a speciality. Entry Updated: 15/4/2010 | Out of date? [Our range of] stock includes a wide variety of Bibles of many different translations and languages, study books, topical Christian literature, children's books, teaching materials, songbooks, DVDs CDs, Bible software, Posters, ornaments, gift items, jewellery and a wide range of greeting cards. Since Easter 2015 the shop has been run by Greater Things, a non-denominational charity in Rugby: find out more on facebook.